The small team of The Funambulist is happy to announce that the 12th issue of the magazine (July-August 2017) is now released. Racialized Incarceration constitutes a form of sequel to issues 4 (Mar-Apr. 2016, Carceral Environments) and 5 (May-June 2016, Design & Racism). This issue builds on these two precedents in demonstrating that incarceration is one of the horizons of processes of racialization and that architecture is an unsurpassable instrument of its enforcement. 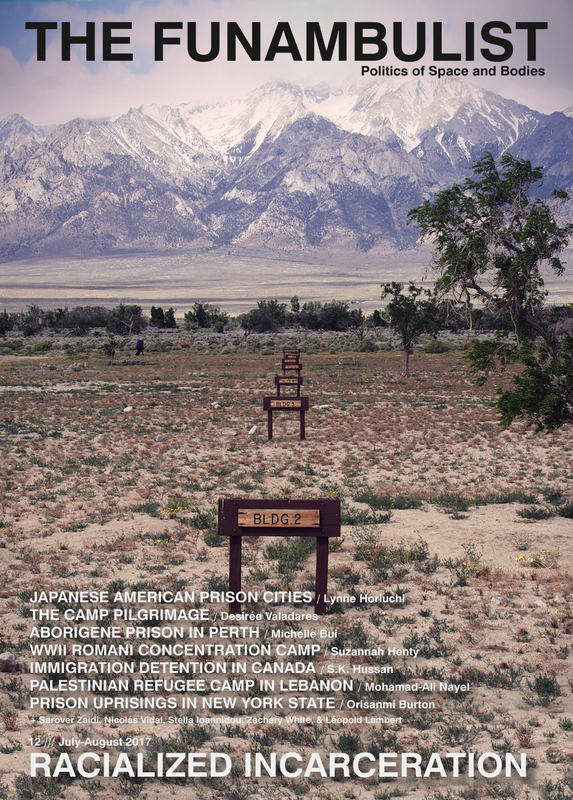 Through historical examples (concentration camps of Romani people in France, prison cities of Japanese and Japanese American people in the United States, an Aborigene prison in Australia) and contemporary ones (US prison industrial complex, immigrant detention centers in Canada, Palestinian refugee camps in Lebanon), The Funambulist’s 12th issue intends to illustrate how the violence of colonial and structural forms of racism endure time and materialize in space. Contributors: Nicolás Vidal, Sarover Zaidi, Suzannah Victoria Beatrice Henty, Lynne Horiuchi, Desirée Valadares, Mohamad-Ali Nayel, Michelle Bui, S.K. Hussan, Orisanmi Burton, Stella Ioannidou, & Zachary White.